The family gesneriaceae contains some beautiful plants but most are frost tender and the most popular genera are house plants or greenhouse plants. Sinningias (gloxinias), saintpaulias and streptocarpus are all popular ‘hobby’ plants. Ironically, the hardy gloxinia (incarvillea) is in the florally rather similar Bignoniaceae. Hardy gesneriads include the scarlet, Chilean mitraria and ramonda which looks just like a hardy African violet. Asian chiritas are almost hardy and bear a striking affinity to African streptocarpus. So it was exciting to find a plant in the local garden centre that looked decidedly like a gesneriad but was a hardy shrub. Lysionotus pauciflorus is a small, rather rambling shrub, about 60cm high, from China where it grows in south east provinces and also in Taiwan, north Vietnam and Japan at elevations of 300-2200m. 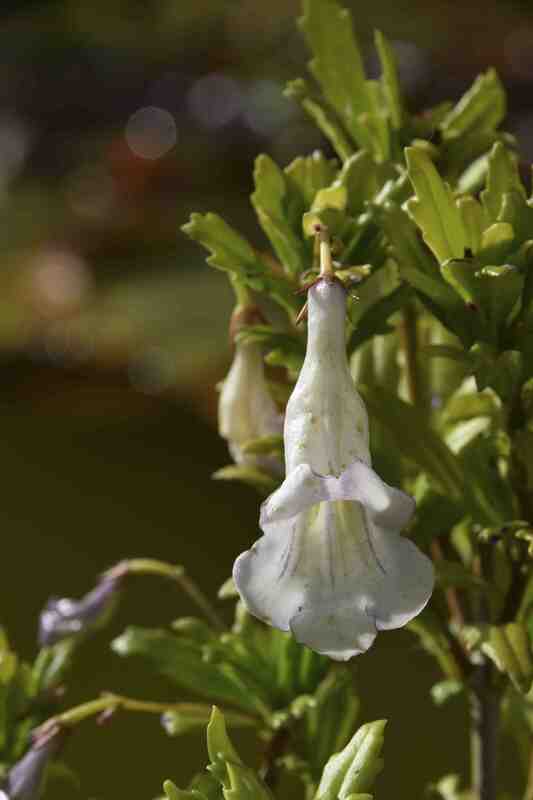 It has rather leathery deeply indented leaves and large, pale lilac flowers marked with darker lines through the throat. They appear unscented. I am not at all certain about how to grow this and it will have to stay in a pot for the time being. I suspect it may need protection from very bright, dry sites and some shade might make the leaves a deeper green than the rather yellow shade it exhibits at the moment. It is probably hardy to about -6c. Crug Farm plants sell this, from a collection made by themselves and Dan Hinkley that was growing as an epiphyte on limestone rocks in humus-rich soil so it may not need acid soil – though the build up of humus on the rock may have created an acid compost for the plants. Crug Farm recommend an acid or neutral soil and protection from frost but that may apply just to their collection. It is too early for me to rate this plant but the flowers are showy and it gets extra marks for being so interesting. It would be a good plant for a woodland garden to give some late colour and to add interest to the more obvious azaleas, cassiopes and gaultherias. Very interesting…will be good to know how you get on with it… missed out on Crug this year, we meant to go on our way home from N’Wales but the weather got the better of us. I had my list in hand….never mind there’s always next year…. As you say, there is always next year! and I will report back on how it gets on with its first winter!